Coco Cha Cha, a Filipino dessert at Ongpin in South San Francisco. • Since its launch in San Francisco 2010, Off The Grid has grown into as close to a full-service food truck consultancy as exists in this region, with recurring markets and other special events in SF, Alameda, San Mateo, and Marin counties, with more local areas planned. There's a guidebook written in-house that's available to prospective vendors who want to learn how to navigate the legalities of getting a truck off the ground, or people can book appointments to discuss the same matters. An extraordinary service takes that even one step beyond, with an Off The Grid branded food truck that's available for rent by the day for road testing mobile food dreams. Three job opportunities have just cropped up within Off The Grid: market manager, special events sales coordinator, and special events coordinator. Last year's special events included several Saturday afternoons at Berkeley's Golden Gate Fields racetrack, so party planners who can't think outside the box won't be a good fit. Imagineers who are ready to push the boundaries, however, should take these opportunities into consideration. 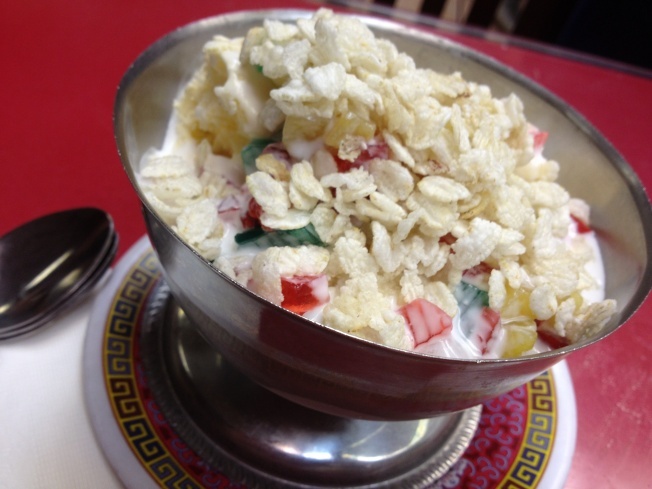 • Bite of the week: Coco Cha Cha at Ongpin (73 Camaritas, South San Francisco). Filipino desserts are a match made in heaven for people with a healthy sweet tooth. One of the most popular offerings is called halo-halo, from the Tagalog word that means mix; it's so named for having a number of different ingredients such as shaved ice, beans, tropical fruits, and ice cream to intermingle with your spoon. Coco Cha Cha also goes for a similar approach. Ongpin's version towers with layers of Rice Krispies, vanilla ice cream, candied yams, Christmas-hued gelatin cubes, and coconut milk. While the restaurant inspires overindulging on entrees with its generous bowls and plates of meat, here's an instance where saving room for dessert will reward with the lift of a fresh discovery. Mix it up a bit.